The City of Atlanta prepared for Super Bowl LIII for years – organizing transit, road closures, and public safety initiatives. While the Big Game was just a single day, hundreds of thousands of visitors arrived to the city to attend special events in the two weeks leading up to it. 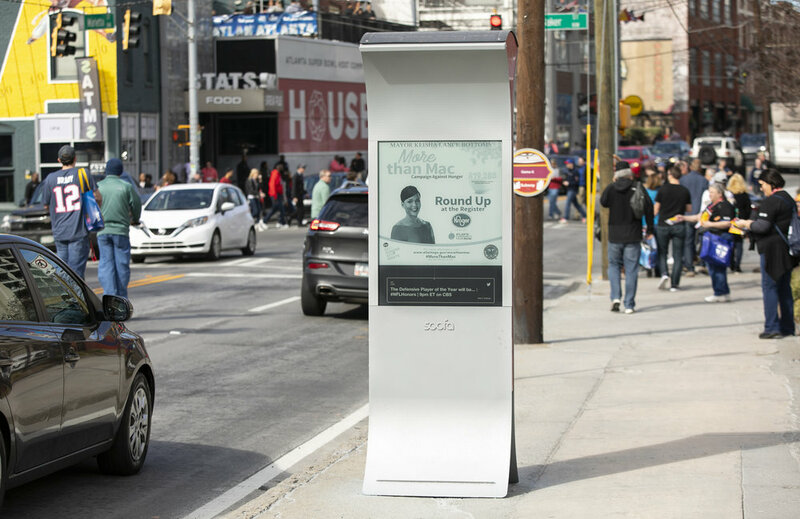 In preparation for the flood of people coming to the Downtown and Centennial Park neighborhoods, Mayor Lance Bottoms sought to use Soofa Signs as an outdoor, real-time messaging platform to reach residents and visitors on the most heavily trafficked downtown streets. The city knew that Soofa Signs could enhance and extend their digital communications platforms like Instagram and Twitter, to reach locals and visitors who are not otherwise connected to the city online. In order to install new Signs in the ground in time for the Super Bowl, the City’s construction moratorium around Mercedes Benz Stadium and Centennial Park was lifted exclusively for Soofa. In just one day, Soofa, in partnership with the Atlanta Department of Public Works more than doubled the number of Signs in the Downtown and Centennial Park neighborhoods ahead of the Big Game. Soofa Sign locations were determined based on normal pedestrian traffic patterns and anticipated influx of traffic leading up to and during the Super Bowl. As we do for all Sign installations, we collaborated with the city to determine the best locations that would be most impactful for wayfinding and displaying up to the minute MARTA arrival times, not only during the two weeks leading up to the Super Bowl, but for Atlanta’s residents and visitors always. 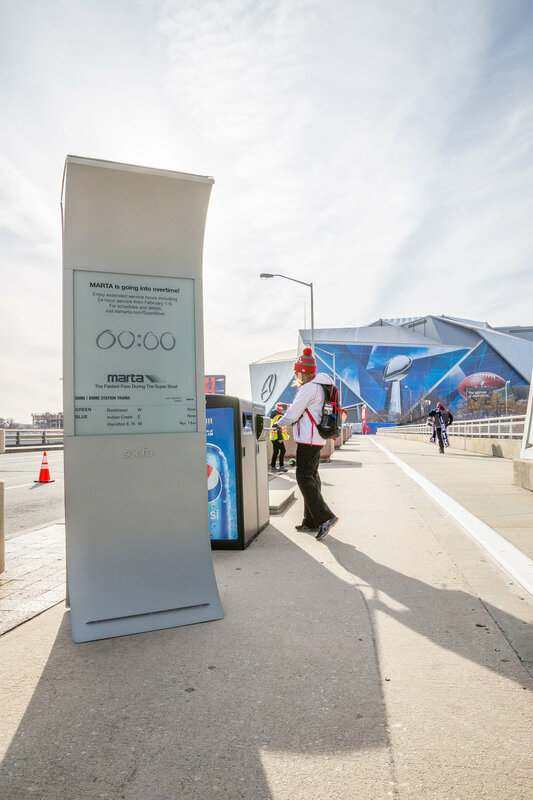 25% of Soofa Sign screens is dedicated to real-time transit updates, so they are strategically placed near some of the busiest MARTA stations (Five Points, Mercedes Benz Stadium Peachtree Center). A collaborative digital content strategy between public and private partners was a win win for locals and visitors of Atlanta during the Big Game. 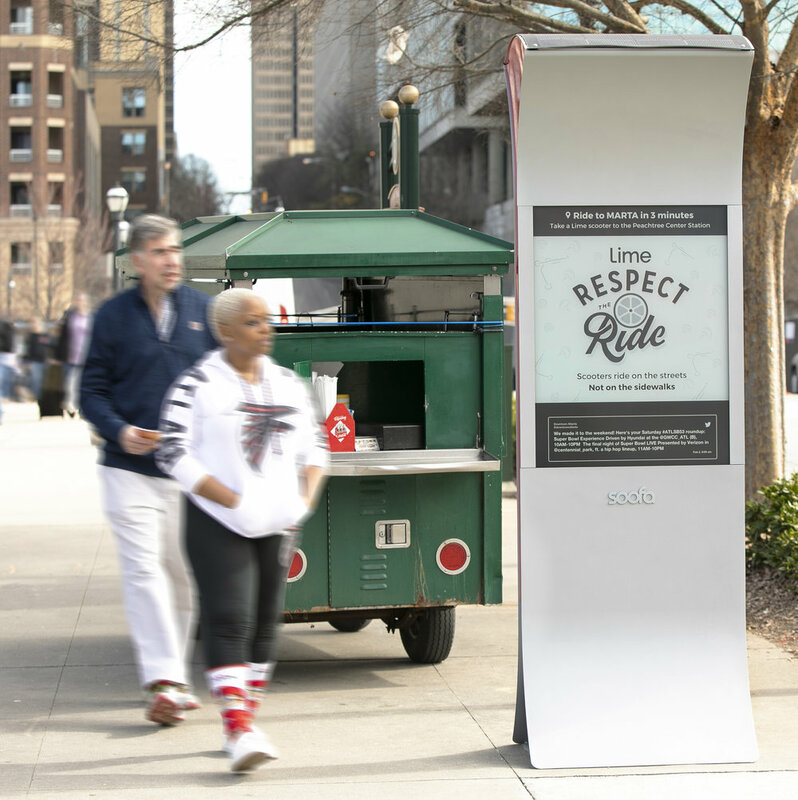 The City of Atlanta and MARTA both created and published their own content through Soofa Talk to display on the Signs before and during Super Bowl weekend. In particular, the messaging encouraged people to take public transportation to avoid major congestion. ATL311 supplemented this messaging with content explaining how visitors and residents could sign up for NotifyATL to receive real-time SMS updates around issues they should be aware of during the festivities. Mayor Lance Bottom’s office also announced the Mayor’s “More Than Mac” Campaign Against Hunger in partnership with Kroger. 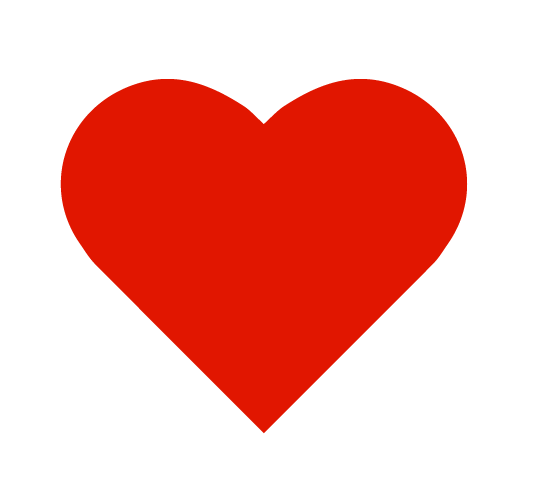 Our community of advertising partners benefitted by the increase in foot traffic as well, and did their part to create neighborhood specific content that would be mutually beneficial with the city. Lime displayed dynamic wayfinding to help people get to the nearest MARTA stations quickly and efficiently on scooters from their current location. The City of Atlanta has proved their ability to coordinate and execute quickly for large-scale events, in order to keep the public informed and safe. Though it was the lowest scoring Super Bowl game in history, The City of Atlanta can consider Super Bowl LIII a major win. Seamless coordination between the City of Atlanta and Soofa leading up to and during Super Bowl weekend. Siting Soofa Signs in locations that are beneficial for visitors and locals, both during huge events like the Super Bowl and for everyday residents, workers, and tourists. Digital content strategy was collaborative, focused, and effective between Soofa, City of Atlanta, MARTA, and advertising partners. Bring Soofa to your neighborhood.